Raheem Sterling has packed a lot into a young career that is going from strength to strength under Pep Guardiola at Manchester City. The 23-year-old penned a bumper new contract with the Premier League champions on Friday, with the extension running through until the end of the 2022-2023 season. Progress has not always been serene for the former Liverpool youngster, who is no stranger to setbacks and heavy scrutiny. Here we look through some of the highs and lows experienced to date by one of English football's most exceptional talents. Coincidentally, following three substitute cameos in the previous season, Sterling made his first Premier League start when Liverpool hosted Manchester City in August 2012. He turned in a live-wire display in a 2-2 draw and an England debut came against Sweden three months later. It was during the following 2013-14 campaign when the Londoner truly established himself at the top level, starring in an irresistible frontline alongside Luis Suarez and Daniel Sturridge as Liverpool pushed City agonisingly close in the title race. Liverpool were unable to build upon their second-place finish and stalled the following campaign, tumbling back down the table after Suarez's switch to Barcelona and an underwhelming Champions League return. Brendan Rodgers survived the close season but eventually lost his job in October 2015, by which time Sterling had moved on to pastures new. Contract talks stalled and an ill-advised BBC interview to discuss his situation, which was not sanctioned by the club, proved a PR disaster. The ample number of proud ex-Liverpool players in the punditry fraternity meant sympathy for the youngster felt in particularly short supply. Although Sterling started brightly at City, his form tailed off after Christmas in the 2015-16 season, mirroring the malaise that typified the end of Manuel Pellegrini's managerial tenure. There followed a personal and collective ordeal at Euro 2016. Sterling dubbed himself "The Hated One" on social media following criticism of his performance in England's opening draw against Russia. He missed a glorious chance in the win over Wales and was unable to arrest the last-16 humiliation at the hands of Iceland, despite winning an early penalty. Tabloid scrutiny of his private life also reached an unsavoury crescendo around this time. City's lack of direction during the first half of 2016 could partly be attributed to knowing Guardiola was waiting in the wings to succeed Pellegrini. The former Barcelona and Bayern Munich boss began earning his money before officially taking up the post, calling Sterling during his Euro 2016 woes and offering assurances he would be part of his plans. It was an opportunity offered and taken. Sterling was not flawless, but 10 goals and 19 assists in a transitional campaign made sur his manager's faith was restored. City signing Bernardo Silva and attempting to bring in Alexis Sanchez for the 2017-18 season did not necessarily bode well for Sterling but, as Guardiola's relentless winning machine hit top gear, he proved pivotal. The goals started to flow and his late winners – Bournemouth, Huddersfield Town, Feyenoord and Southampton all thought they had escaped with a share of the spoils until Sterling had other ideas – were a symbol of City's record-breaking efforts as they lifted the Premier League and EFL Cup. Starting every meaningful match in England's first run to a World Cup semi-final for 28 years should have crowned the best season of Sterling's career in style. But, despite his tireless and intelligent running winning the approval of team-mates and numerous respected observers, the Midas touch in front of goal deserted him and he failed to find the net at all in Russia. In its pre-tournament coverage, UK tabloid The Sun took front-page offence over a tattoo depicting a gun on Sterling's leg. After his World Cup experience, there was sense of exorcism when Sterling cut in from the left flank and hammered home in City's Premier League opener against Arsenal – the goalscorer tellingly wheeling away with a finger to his ear in celebration. His finishing has never appeared so assured, with a stunning Champions League strike at home to Shakhtar Donetsk the latest example. 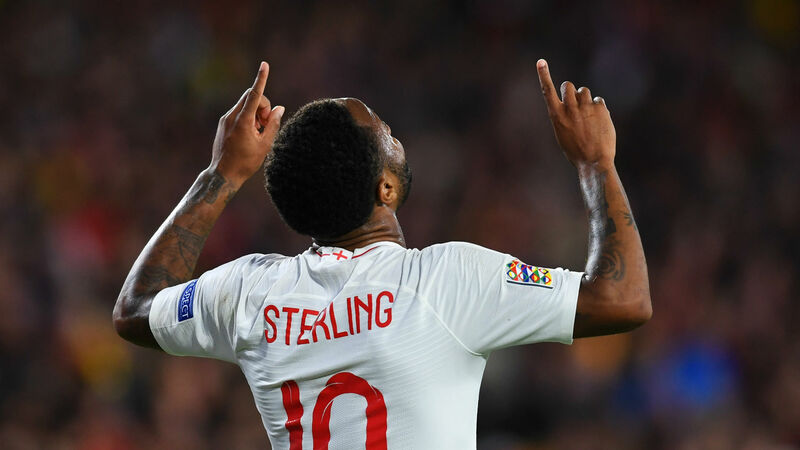 Sterling also emphatically ended his barren run for England with a brace in the 3-2 Nations League win over Spain in October. It is a run of form that made links to Real Madrid seem increasingly plausible, meaning the news of Sterling becoming one of City's top earners comes with a hefty helping of relief on the blue side of Manchester ahead of the derby this weekend.